Sometimes fashion is so focused on the next big thing--the little-known designer about to hit the stratosphere, the It bag of the season, or the hot trend in shoes--that it's easy to forget about the classic standby pieces upon which a wardrobe is built. Thankfully, Old Navy hasn't forgotten that fashionistas still need flattering, affordable basics they'll wear season after season. I can't wait to see what their New American Classics collection looks like in-store. 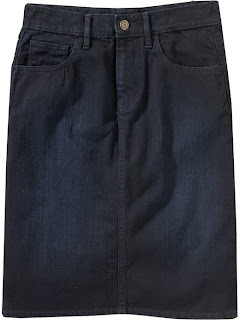 In the meantime, check out this great dark denim pencil skirt priced at $26.50. A bit of back story to explain my admiration of such a basic piece: Years ago, I found a knee-length asymmetrical hem skirt in dark wash denim in Chinatown for next to nothing. It has since formed the basis of many outfits. When it's cold, I wear it with tights or leggings and my black leather boots. When it's warm, I throw it on with a colourful tee and some strappy flat sandals. For going out, it looks great with a low-cut black top and some platform heels. Ah, the virtues of the humble knee-length denim skirt! Thanks for the inspiration. A denim skirt is something I think that I'd be very happy to find in my closet! Very nice! I love my denim pencil skirt, its so easy to throw on and feel great. Great find! I've been looking for a good denim pencil skirt and haven't found one that's the perfect fit yet... I'll have to check this one out. What an awesome find!! Well, denim pencil skirts are my favorite too.